Your business is important for you: your look, your customers' satisfaction. That's why it's also important to us. Our custom large-scale wall mirrors add beauty and function to your space with just the quality you deserve and a price that works for your bottom line. 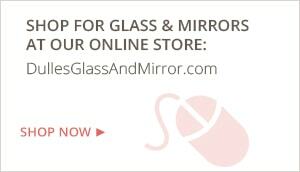 Customizing your mirror is easy with the experts at Dulles Glass. Get a quote with the information you know about your mirror project, and someone will contact you with a preliminary quote for free, in 24 hours. We'll help you get it just right for your business and your customers. Dulles Glass has the fastest turnaround time in the business. This means that you can normally have your mirrors installed in 7 business days from the time of your approved plans. Dulles Glass has full-time, professional installers on staff, so you know that your installation will be completed on-time and budget, and with the highest quality. We offer a comprehensive 2-year warranty on our mirror products. Limit one per person. Valid on "short-of-wall" installation only. Not to be combined with any other offers. Washington, DC metropolitan area only.